A Burmese python could be lurking in a Maine River near a playground, but wildlife officials have no plans to capture it. "Unless the animal poses an immediate risk, people are safe," said Wildlife Biologist Brad Zitske of the Maine Warden Service. 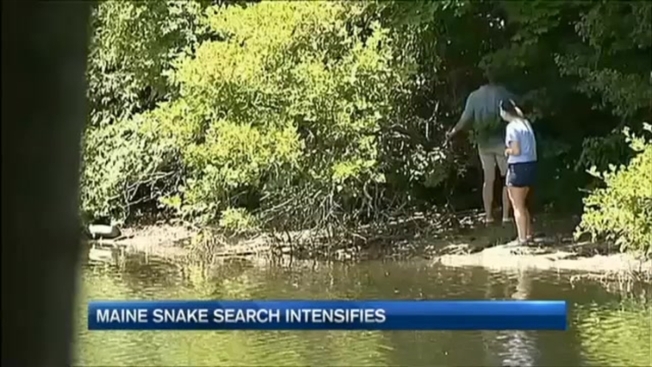 The snake was first reported last week, when a woman spotted it near the Presumpscot River in Riverbank Park in Westbrook. She told police it appeared to be the length of a truck with a head the size of a soccer ball. Early Wednesday morning, two Westbrook Police officers patrolling the park also observed the snake. They believe it was eating a beaver. Based on those descriptions, the Maine Warden Service has tentatively identified the snake as a Burmese python, which is, on average, 12 feet in length, but can grow up to 18 to 19 feet. "It is almost certainly an escaped pet," said Zitske. Onlookers continue to visit Riverbank Park hoping to catch a glimpse of the snake. Biologists encourage the public to keep a safe distance and call police if a snake is spotted. "While this undoubtedly has some interest, just give it space," said Zitke.